No Job too Big, No Surface too Small. Five Star Coatings Group provides both one sided and two sided coated products to suit most applications. 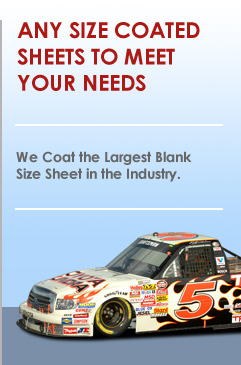 We have the ability to coat the largest blank size sheet in the industry, offering coated sheets as large as 6 foot by 10 foot, and up to 600 lbs. per sheet. Our state of the art facility has the capabilities to apply a wide range of coating technologies to meet any of our clients needs. From abrasion resistance to anti-fog performance requirements, you can trust the experts at Five Star Coatings Group. Our facility has been designed with flexibility in mind, allowing us to apply coatings to both flat and pre contoured applications of any size or shape. Our cutting edge technology and flexibility truly puts Five Star Coatings Group at the forefront of total solutions providers. © 2016 Five Star Coatings Group Inc. All rights reserved.